The requirements for a modern ICT infrastructure are very complex and change very fast. We support you in developing and implementing extensive cyber security solutions for data center, enterprise, perimeter, data encryption, endpoint and mobile settings as well as identity & access management. Our extensive background enables us to integrate selected and tested products to comprehensive solutions for your enterprise security. Our own ICT and security experts will gladly help you for the optimal architecture, implementation of IT-Security products and sustainable operation of the IT-Security Infrastructure. Our cyber security experts find the best security solution for every company, in terms of financial viability and technology. First-rate technology and security specialists for comprehensive cyber security. 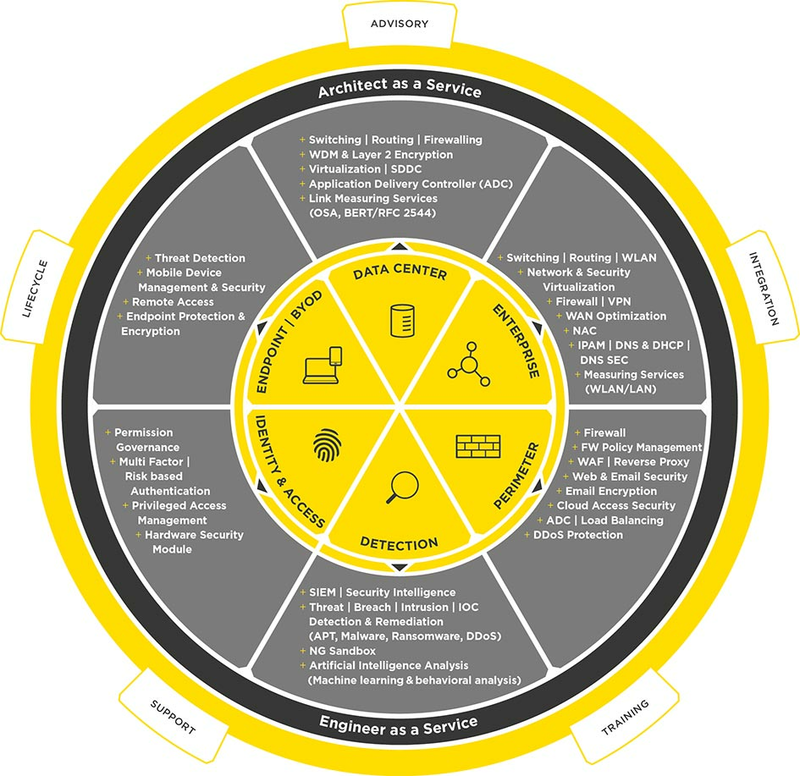 All elements of IT security infrastructure from a single source, depending on your requirements. Seamless mix of complete ICT security products. Cyber security is our core competence. Our specialists are equally well-versed in the various technologies and their practical implementation. Working with our customers, we develop economically feasible solutions that are sustainable for the long term. Strategic partnerships with the leading IT-Security manufacturers guarantee the effective use of state-of-the-art technologies. Acting as a partner, we support each company in line with individual needs throughout all phases, from planning through implementation to the operation of the systems. We advise you on choosing the optimum ICT security solutions with the best design. The data center is the heart of every company, because here are the corporate values - the data - stored. Therefore, it is vitally important, that Data Center are implemented completely reliable and secure. Security in the data centre is becoming increasingly important. We offer a solution for comprehensive security in your data center. This considers the creation of zones as a security measure in the enterprise - as is prosposed by ISO 27002 - and the protected transmission of the information into a backup computing centre. Thanks to our expertise surrounding LAN/WAN infrastructures we are in a position to provide you with a comprehensive solution. A new approach to the solution in LAN architecture enables us to increase the performance and availability of the architecture whilst saving costs at the same time. Network perimeters provide a significant challenge to the information security. Maintain control over the entire volume of incoming and outgoing data traffic and protect your company’s network from web-based threats. We help you with our experience and expertise in the design, implementation and operation of a secure gateway solution. Our perimeter solution is based on a layered security approach that is tailored to the needs of the customer. InfoGuard offers a comprehensive portfolio of Swiss encryption products designed to guarantee the security of your information and the protection of confidential telephone calls and fax transmissions with offices and business partners. The access protection on IT systems is becoming increasingly important. The unique identification of the user is only one aspect. A company must also know what changes were made to the IT system. We have many years of experience in constructing and operating infrastructures for granting certificates and the administration of smart cards, soft tokens, and tokens. We would be happy to help you in defining the processes and implementing the authentication solutions in your existing network infrastructure. Strong authentication by means of certificates takes account of these increased demands on user identification. The use of certificates has taken on global dimensions, from logging on to the PC or gaining access to network components, up to remote access and, of course, not forgetting data encryption. Mobile terminals, which leave the protected network to communicate over outside networks, represent an additional risk. InfoGuard provides you with a solution for targeted user awareness, comprehensive protection of your terminals and mobile storage media. We use our experience and skills to help you with the configuration, implementation and monitoring of your IT security infrastructure. Our comprehensive and practicable range of security solutions comes from our own production and the cooperation with selected suppliers.